and yes, i did bring a teapot with me to university. top; primark. 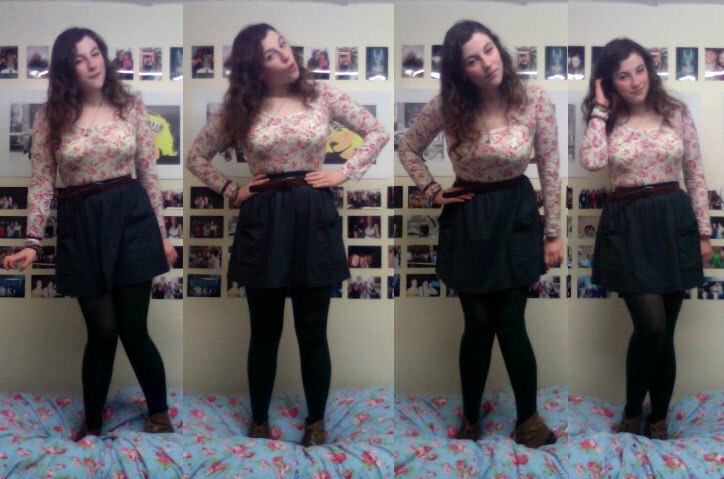 skirt; american apparel. belt; charity shop. tights; topshop. boots; asos. necklace; accessorize. Great pics! And lovely shoes! Lol ^^ Well, it's just that all their songs are like that ^^ I love your boots! i looooove that top! it's so cute! PIXIE ROBIN HOOD TIGHTS! I neeed a pair! the colour is perfect for your hair! I love the green tights! These photos are so adorable! And I love that you brought a teapot-every needs a little luxury, even if it's just 15 minutes for a good cup of tea! very impressive given you had 3 seconds! thanku so much for commenting on my blog, means alot! feel free to follow me on google friends and bloglovin! I love the pics and you are so funny! I like these photos--they're so much fun! And I love the feminine top with the rugged boots. the boots are perfect for the top. darling, you look so cute! That top is simply perfect! I really want some Primark in my closet now. And I am envious of how gorgeous your hair is. oh you're not the only one with the internet connection problems! i face that almost everyday, here. i think that the photobooth is a really fun tool to have. ;) given with or without a camera. it's so fun to play with and mess around with. Lovely blog ;)! Check out our new HotPicks Contest on http://www.stylight.com/Hotpicks/! Get your own Escapulario Bracelet for free and win a trip to Paris! flowery sweaters are the best. you look lovely! Lovely outfit - the tights and the boots are my faves! Lovely outfit the top is so gorgeous. I don't have the best camera myself and even though it is better than your situation, I know that it can be hard to get pictures. I takes me many attempts. Regardless, I think you did well regardless and I can still see your outfit well. Your outfit is seriously cute! Love the boots and I have the same bedding as you!! I love the green tights, such a great color. I need to get a pair like that! cute outfit. i really like the shoes. 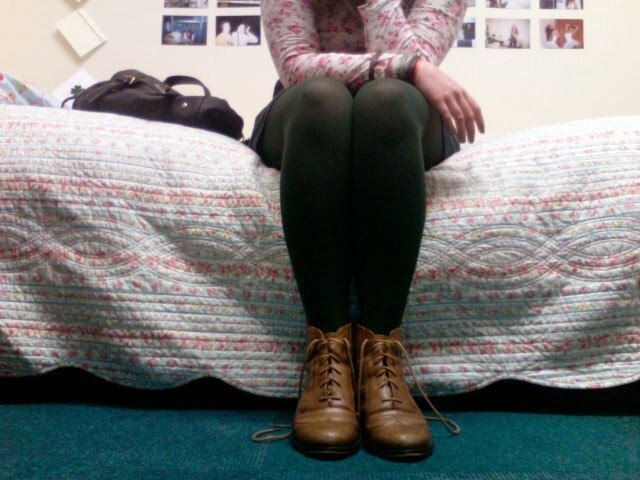 I like the hunter green tights. and i am so sorry i am so late to check this post out , how have u been anyway? I actually really really love this number. Every aspect of the outfit is paired beautifully. You look so stunning. Love your style and blog. ahah! You look adorable, those boots are seriously great! I'm sure you'd like Half Nelson, is a really beautiful film. I love it :) You are so cute! You always have the cutest photos! really love that sweater and oh- those shoes are so perfect for fall! Adorable outfit. Loving the shoes. And that black and white polka dot tea pot in the background on the second photo is so cute! ahah! I know, 3 seconds are not enough!! oohh honey! i'm in love with your uncle boots!! Hahaha! Maybe you can ask for a camera for Christmas? But I think these are basically well done, considering your technological struggles! And a teapot is a necessity of life, obviously! I like the photo booth series! Maybe the new to take outfit pictures. your cute! i like the teapot! Sometimes photobooth is all we have :) Cute! Oh I love your top!! this is a lovely outfit! awesome boots indeed! super cute outfit, you're adorable. i like your top..nice style..
ahaha too funny. And just as an aside- my gosh the photos on your wall are INCREDIBLY neat!! Great outfit! Love the booties!